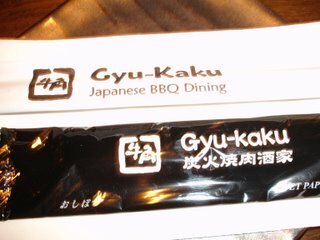 A couple of months ago, my husband and I were walking around Old Town Pasadena when I saw a sign that read "Gyu Kaku, Opening April 2006." I shrieked and jumped up and down, tugging on poor J's (husband) sleeve yelping about how I used to go there often when I lived in Japan, the good times I had there with friends, the great yakiniku and jockey (mugs) of cold beer, etc. I know there are other Gyu Kaku locations in L.A. that have been open for awhile but none even remotely convenient to my Eastside residence so I was extremely excited about the Pasadena opening. 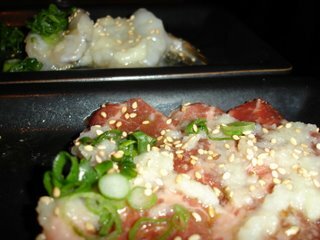 Gyu Kaku is a chain of yakiniku (grilled meat is the literal translation but it's basically Korean barbeque, Japanese-style) restaurants all over Japan. Unlike most yakiniku places, Gyu Kaku Japan is reasonably priced and therefore popular with young people. My coworkers and I would go when we wanted to treat ourselves- again, Gyu Kaku isn't expensive compared to other yakiniku places but yakiniku, in general, isn't a cheap outing. We'd sit and grill our own gyu tan (beef tongue), kalbi (short rib meat) and ebi (shrimp) while guzzling massive mugs (DAI jockey) of beer. It was a festive place with good food and I have such fond memories of our boisterous Gyu Kaku outings. 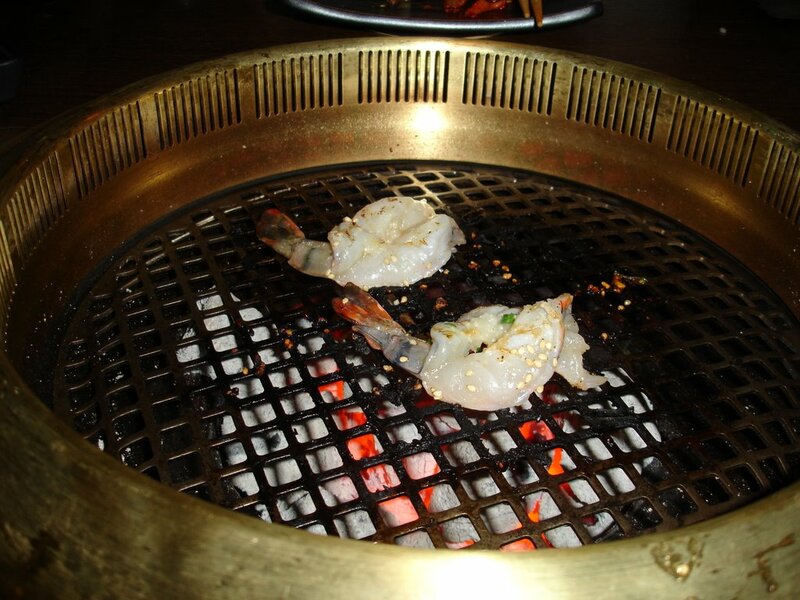 Last night, we made our maiden voyage to the Pasadena Gyu Kaku. We walked into a half-empty restaurant and were greeted by no fewer than three hostesses and a manager who all seemed extremely flustered. When we asked for a table for two, it seemed to make the already confused head hostess a bit nervous. "Oh.....er....do you have a reservation? Oh no? Ok, we will get back to you one minute please..." Their inexperience was palpable. NOT the best way to get started but the place sure did smell good, so I was hopeful. We waited for about 10 minutes and were seated. Our young waiter came straight to the table with a quick explanation of the menu and pointed to a specials sign. 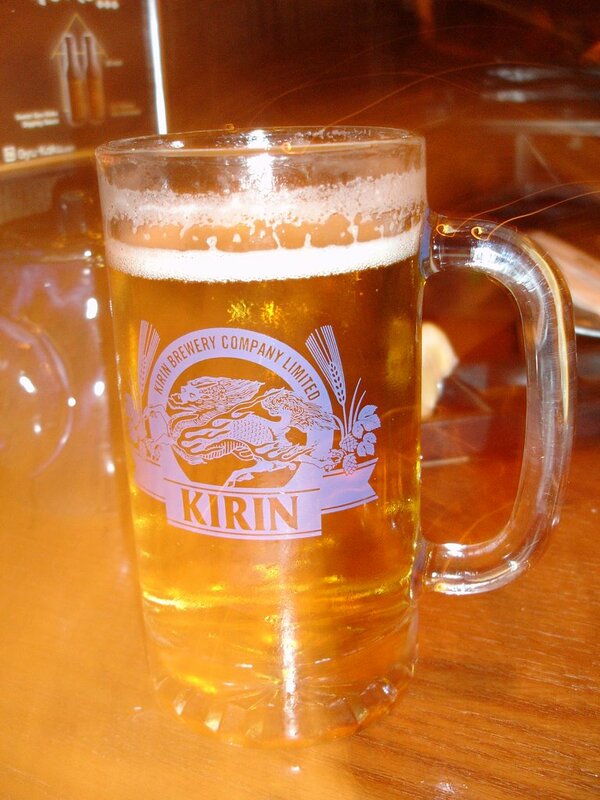 Monday through Fridays, you can get a mug of Kirin for $1.99, which I immediately ordered. 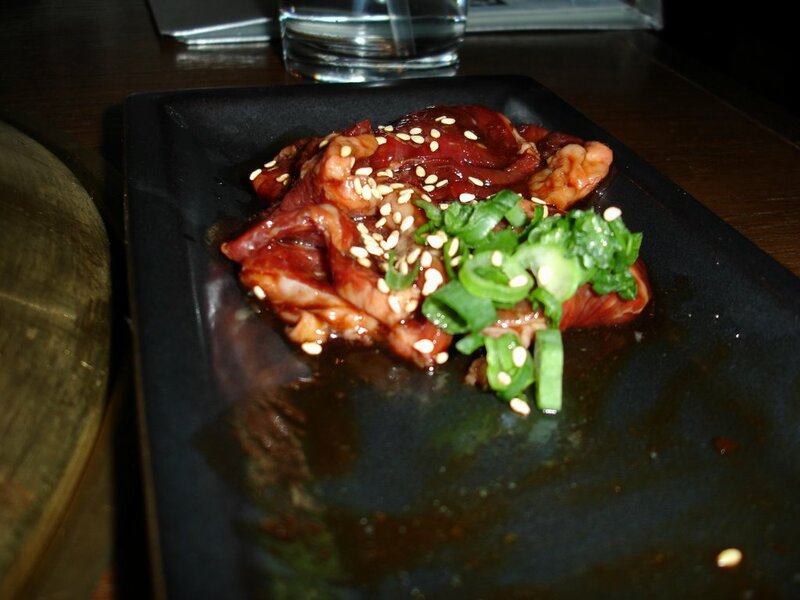 They also offer one dish per weeknight that is 50% off the regular price. Since last night's special was the ahi tuna w/ salt, we went for it. We also ordered the garlic mushrooms in butter wrapped in foil, garlic shrimp, kalbi w/ tare, sliced roast with garlic and white rice. I was excited to start the meal. In about 3 minutes, the foil packet containing the mushrooms landed on our table and we threw it on the grill. The tuna arrived next, and I could see why it was 50% off. There were three measly little slices of tuna on the plate- no wonder it's 50% off! It's less than 50% of the regular serving. So actually, it isn't discounted at all. In fact, they're making more money from it. This really, really irritated me. Do they think customers are that stupid? Since it wasn't the waiter's fault, I decided to keep my mouth shut and just tossed it on the grill. It was not even good- it was actually quite fishy. I tried to remain positive but doubt was beginning to creep into my brain. The roast came next- the meat was good but again....the plates were very very small. I was expecting the nice amount of thinly sliced beef spiraled onto a large round plate that you get in Japan. Instead, you got about 7 slices (thumb-length) of meat on a small, rectangular plate. For $6, I guess it isn't awful but can you believe that the Japanese counterpart is actually bigger than the American? Hell just froze over. The kalbi was also good but again, was gone in a flash due to the small portion. We got 4 butterflied shrimp for $7.95 and about 1/4 cup of kimchee for $4. When we opened the foil packet, it contained about 1/2 cup of quartered, regular 'ol button mushrooms. I guess I was expecting some enoki or shimeji or some other kind of Japanese fungi. The main thing you noticed (other than the Lilliputian portions) is that all of the wait staff are YOUNG. I mean, maybe barely 21 (since you have to be 21 to serve alcohol right?). Young and amateur. Every time one of them enters an order into the computer and yells "O-da onegashimasu! (Order up!)" all of the remaining staff yell back "Yorokonde! (with pleasure)" which is cute, but it's so forced that you feel bad for them. You can tell that the staff has been drilled on the Gyu Kaku way: filling up the water glasses every time a customer takes a sip, taking the plates off the table the MINUTE that last piece of meat has been put on the grill and asking repeatedly if you'd like anything else. I appreciate the effort but it's just impossible to relax when you've got more wait staff than customers (honestly- there must have been 35 waiters) buzzing around you constantly. Not only that, but you just sense that each waiter has been groomed to be void of personality and simply repeat the Gyu Kaku chants robotically. 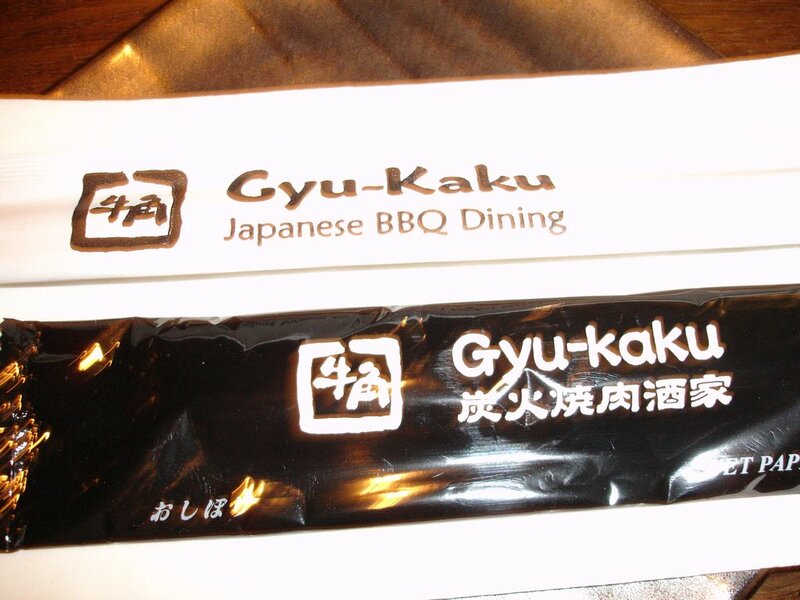 I know it all sounds harsh- and it is probably my fault for hanging onto the dear memories of my many fantastic dinners at Gyu Kaku in Tokyo. My father always tells me that you can't relive the past- even if you go back to the exact same place with the exact same people, each experience will always be different. Life changes, and although you can create many wonderful new experiences, you can never totally recreate ones you've already had. Although I realize this, I guess sometimes I need to be reminded. And that's what my trip to Gyu Kaku Pasadena did last night. I think both of us with forever be stuck trying to relive our Japan eating lives. I totally understand you, we can't relive the past but it's nice to have those ~natsukashii~ moments! that is sad, cause i always think about food that i can never have again from places that have closed long ago... kinda depressing... whats worse is i'm a "comparer" and i always compare things from long ago to the present and the present always loses... ugh..
i guess we'll have to make new discoveries to compensate for lost ones huh??? TAG, as much as I want to try this place, my friends warn me about the price and portions. you might as well throw your wallet on the grill while the food is cooking. 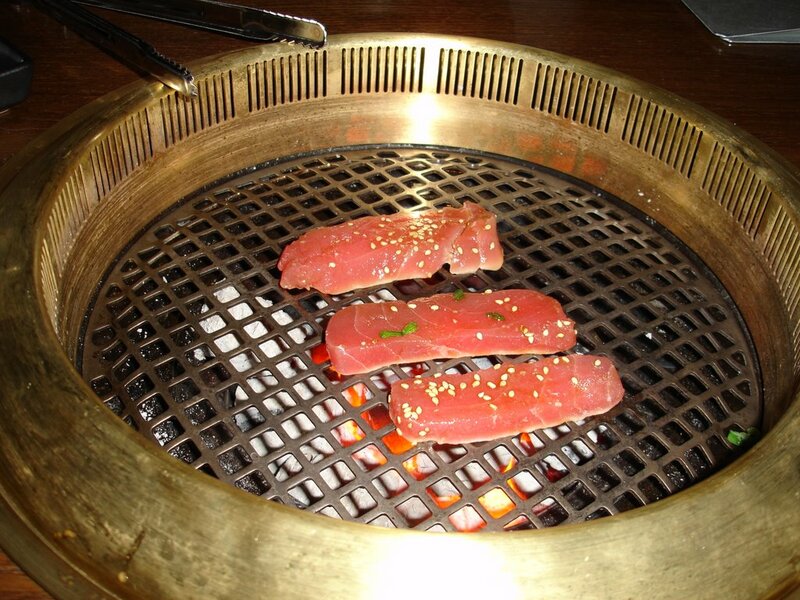 when i've been spoiled by places like manna korean bbq ($14.99 all you can eat), it's hard to downsize at Gyu-Kaku. I first tried beef tongue at Musha's in Torrance and loved it. I would imagine that Gyu-Kaku would give 3-4 slices for $9-10. If you like korean bbq, i recommend Manna. Meat quality is ok, but overall, it's a fun place to hangout w/ friends and drink/eat. Aww. Too bad. Looked promising too. Expensive meals are fine, but expensive meals that you don't feel you got your money's worth? Inexcusable. Great review though.